Raees vs Kaabil Advance Booking Report: Shahrukh Khan and Hrithik Roshan are finally ready to run against each other at the box office. The pre-bookings started in Mumbai, Delhi-NCR, Kolkata, etc. almost one week before the release dates of Kaabli and Raees. It will be the first Bollywood box office battle of the year between Raees and Kaabil. The movies of Shah Rukh Khan and Hrithik Roshan will start fighting each other on the eve of Republic Day 2017. Shahrukh and Hrithik both are the lead actors in their respective films. In Raees, SRK plays a bootlegger, who sells his liquor in Gujarat. Raees, directed by Rahul Dholakia, stars Pakistani actress Mahira Khan opposite to SRK. On the other hand, Hrithik plays a blind man role in Kaabil (directed by Sanjay Gupta) which is a love story of two blind people and a revenge drama. Hrithik and Yami both are portraying the blinds. Both the films are non-holiday releases. Raees teaser had released in 2014 while the trailer came out in 2015 and finally film releases on 25th January 2017, Wednesday. Now all eyes will turn to the box office results to see which film claims victory. It would be interesting to see which film will get a better opening at the box office. Now the wait is over, so pre-book your tickets. Usually, pre-booking of a movie begins three to five days earlier, but Raees and Kaabil both film pre -booking started one week ago. The advance ticket booking opened across the nation on January 22. The reports of early trends say that the SRK’s Raees is leading regarding advance ticket sales. Also, Kaabil is getting a good response. Kaabil is all set to register a better opening numbers than Hrithik’s last movie Mohenjo Daro while Raees should cross the Rs. 20 cr mark on the opening day box office. It is evident that Shahrukh’s film will dominate over Roshan’s on the first two days. But, after that, the film having better content should fare better than the other. The movie of SRK got a boost in Gujarat due to having Gujju flavor in it. But the best advance report has come from Kolkata. The tickets for the morning shows have been sold out already while evening and night shows are getting useful in no time. His Dilwale also opened to high figures in Bengal. However, the available screens are already houseful in the South India, so the theaters’ owners haven’t decided about its allocation yet. Raess has already sold about 30% of its tickets so far, and it should account to at least Rs. 6 crores by the end of the day. The makers and theaters owners have hiked the ticket prices for the first-day show at some place. Hrithik Roshan’s Kaabil has got better bookings than the expectations. The buzz for the film has increased in the last week or so. Thus, it should get decent advance bookings. The flick has recorded the best in the Mumbai circuit, especially from the evening shows. Hrithik is also popular in the down South and Maharastra, but weaker in the North. So, it will all depend on word of mouth. Though it is also low in Pune and Bangalore, Kaabil has sold around 15% tickets across India. Only one day is left, and the figures should increase to next level for both the films. Stay tuned for the Kaabli 1st day collection and Raees first day box office collections update too. 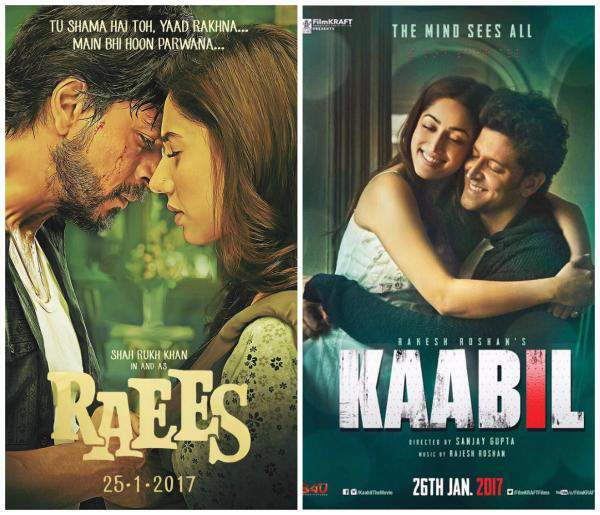 BTW, which film are you going to watch Raees vs Kaabil? Don’t forget sharing. Next articleRaees vs Kaabil Box Office Collection Prediction: Who Will Win Worldwide SRK or Hrithik on 1st Day?